With a new hockey season upon us, albeit a shortened one, collectors need to be on the lookout for potential breakout stars. While there may be no guarantees, it's always smart to look for signs. From a collecting standpoint, getting in early means saving some money down the road. In hockey, goalies are among the most popular players. They're the backbone of their teams. If a goalie gets hot, there's a good chance their team will too. Every night, they have the opportunity to make highlight-reel plays and garner the attention of collectors. As a result, the men behind the mask are some of the most popular in the hobby among hockey fans. Here are five goalies ready to breakout in 2012-13. Collectors may want to keep their eye out for deals in the weeks ahead as all have some solid options, particularly among their rookie cards. Braden Holtby started last season third in the depth chart for the explosive Washington Capitals. This was despite a stellar debut in 2010-11 in which he went 10-2-2 with a 1.79 Goals Against Average in 14 games. Holtby spent much of 2011-12 with Washington's AHL affiliate in Hershey. However, a strong showing in the postseason indicates a changing of the guard between the pipe's in the nation's capital. 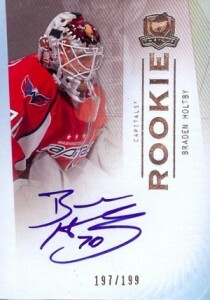 Collectors have nine Braden Holtby rookie cards to choose from. The most valuable comes from 2009-10 Upper Deck The Cup. Numbered to 199, it's also his only autographed rookie card. More affordable options include his 2009-10 Upper Deck Young Guns short print, 2009-10 Upper Deck Ultimate Collection (#/399) and 2009-10 SP Authentic (#/999). 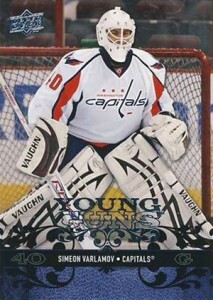 Shop for Braden Holtby rookie cards on eBay. After serving as backup to Pekka Rinne in Nashville, Anders Lindback now finds himself as the likely starter in Tampa Bay. In two seasons with the Predators, the Swedish goalie posted a 16-13 record with a 2.53 GAA. Linback has a total of 19 different rookie cards from 2010-11, ten of which are autographed. Popular choices include 2010-11 Upper Deck The Cup (#/249), 2010-11 Panini Dominion (#/199) and 2010-11 SP Authentic (#/999). At this point, Anders Lindback rookie cards remain extremely cheap with even mid- and high-end autographs readily available for well under $20. Although Tampa Bay may not be a hotbed for hockey card collectors, there appears to be very little risk. 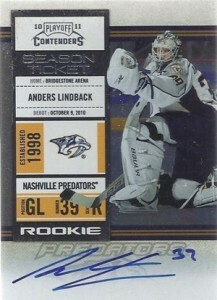 Shop for Anders Lindback rookie cards on eBay. With Tim Thomas opting to take the season off, Tuuka Rask becomes the man between the pipes with the high-profile Boston Bruins. He isn't exactly a new face. Rather, Rask has been given an opportunity to shine. In 102 regular season games since 2007-08, the Finnish goalies has a low 2.20 GAA. Collectors can look for 13 different Tuukka Rask rookie cards, all from 2007-08 products. The most valuable are 2007-08 Upper Deck The Cup (#/249) and O-Pee-Chee Premier (#/299), both of which come with an autograph and memorabilia swatches. The Cup has a patch while OPC Premier has a quad jersey design. Shop for Tuukka Rask rookie cards on eBay. Apparently there's no goaltending controversy in Vancouver this year. Cory Schneider is the man. He has wrestled the job away from Roberto Luongo, who very well could be headed elsewhere. If the Canucks can't find any takers for the veteran, it could cut into Schneider's playing time. It'll also add drama. But heading into the season, the starting spot is Schneider's. From a collecting perspective, Schneider has been on a lot of radars for some time. Still there is plenty of room for growth. 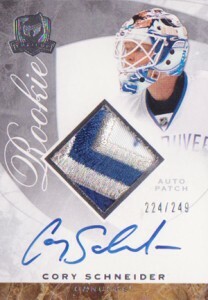 Cory Schneider rookie cards can be found in 2008-09 products. Top autographed choices include 2008-09 Upper Deck The Cup (#/249), 2008-09 SP Authentic (#/999) and 2008-09 O-Pee-Chee Premier (#/299). Shop for Cory Schneider rookie cards on eBay. 2011-12 was a breakout year for Semyon Varlamov, his first with the Avalanche. In 53 games, he had a respectable GAA of 2.59 to go along with four shutouts. Although Colorado has proven winner Jean-Sebastien Giguere as well, the starting spot looks to belong to the Russian youngster. Varlamov has nine rookie cards from 2008-09 products. 2008-09 Upper Deck The Cup is the only autographed rookie card. Other options include 2008-09 SP Authentic (#/999) and 2008-09 Upper Deck. It's also worth noting that his rookies spell his first name as "Simeon." Shop for Semyon Varlamov rookie cards on eBay. 2004-05 Tuukka Rask Finland made Rookie Card!! 2012-13 Limited Patch Cory Schneider 5 SP 12 13 Panini SSP Crease Cleaners !!! !